A group of utilities has formally ended its pursuit of a spent fuel storage site on tribal land near Salt Lake City, Utah. Private Fuel Storage has asked the Nuclear Regulatory Commission (NRC) to withdraw a license for the facility on land leased from the Skull Valley Goshute tribe. The NRC granted a license for the facility about seven years ago, but the Bureau of Indian Affairs and the Bureau of Land Management withheld other approvals needed for the project to move forward. Although those decisions were later overturned in court, the proposal faced intense political opposition at all levels of government in Utah. Opponents often cited its close proximity to a large weapons proving ground and bombing range 45 miles from Salt Lake City. According to the consortium's website, its members included Xcel Energy, Genoa Fuel Tech, American Electric Power, Southern California Edison, Southern Nuclear Company, First Energy, Florida Power and Light, and Entergy. 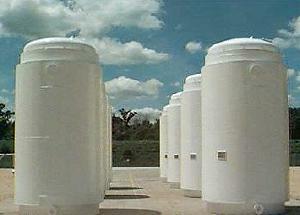 They had planned to build a concrete pad large enough for interim storage of 4,000 dry casks from around the country. They would not be opened, and the waste would not be handled on site.